Want to go faster than a speeding bullet? 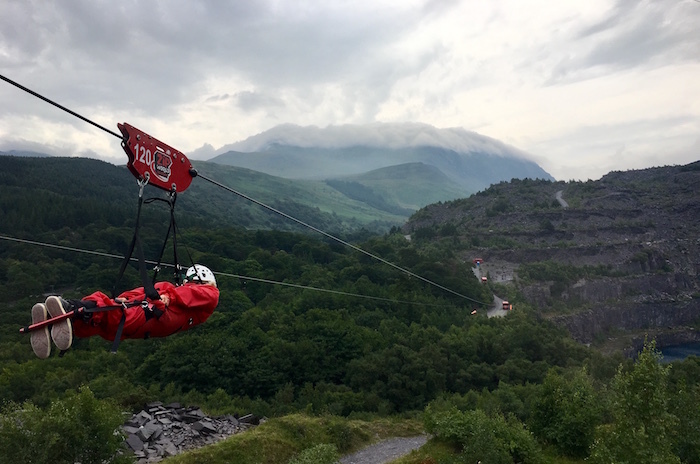 Zip World Penrhyn Quarry in Bethesda, Wales, takes ziplining to a new level – a heart-stopping one. 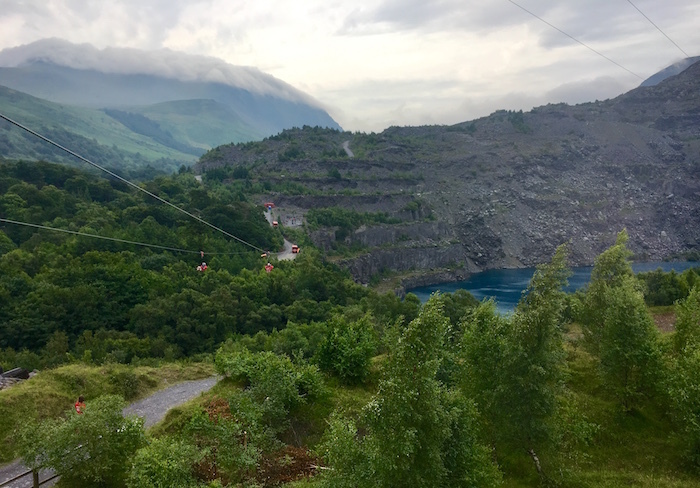 The fastest zipline in the world, the Zip World Velocity Zipline sails over the quarry at speeds that can exceed 100 mph (160 km). If I can do it, so can you. 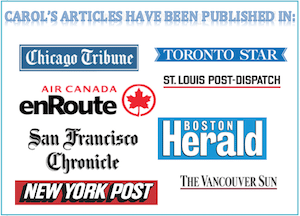 Read on for my experience, or scroll down for prices and practical travel information. I’m standing in a fire-engine red safety suit overlooking an abyss. 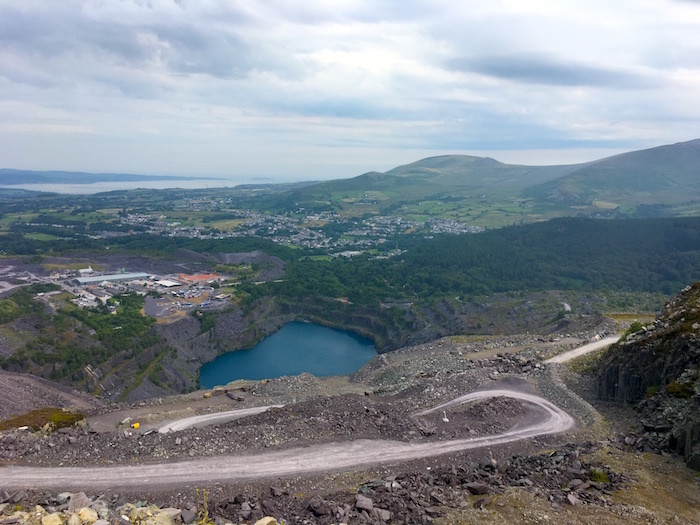 Below me is the Penrhyn Quarry, once the world’s largest slate quarry and now home to an adventure playground called Zip World. In the distance is Anglesey Island and the hazy blue Menai Straights. Shaking out my arms, I gear myself up to fly through the air on Zip World’s Velocity Zipline, the fastest zipline on earth. The woman in front of me is doing the same. Thin, with wire-rimmed glasses and grey hair in a ponytail, she looks to be in her late 70s. “You’re very brave,” I say. Quickly, I see my mistake. I’d meant to say I celebrated her courage, her willingness to keep on being adventurous at an age when many others might stay at home. What she heard is that she looks too old for outdoor adventure. Then I realize I might not have been speaking to her, but to myself. “I’m not brave. I’m quaking,” I admit. Her expression relaxes. This is something we can share. 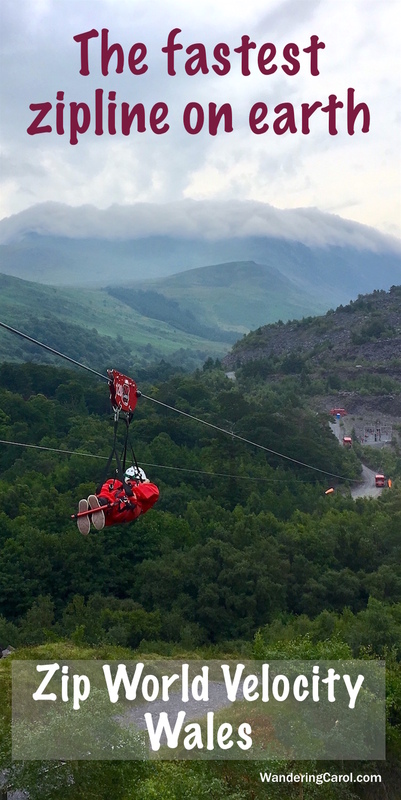 Opened in 2013 in North Wales, the Zip World Velocity Zipline is a mile long (1.6 km), 500 feet high (152 metres), and is the longest zipline in Europe. It’s also really really fast. Superwoman flying through the air fast. Falling off a cliff fast … no, scratch the falling-off-a-cliff image. Imagining superwoman is easier on the nerves. Am I seriously giving a peace sign? The Velocity Zipline is a side-by-side zipline so two people can go down at once. The woman’s husband, who isn’t the least bit interested in attempting this daredevil challenge, waves her off, and she steps up to the platform beside the woman she’s been partnered with. They’re hooked up flat on their stomachs, heads facing forward. They look like missiles ready to be launched. Until today I’ve only ever done ziplining in a vertical position, clipped in and hanging from a wire, so the rocket launch approach is new to me. Luckily we got to do a test run on the 500-metre Little Zipper first so I know what to expect. Lying flat gives you less control but that might be for the best. When I ziplined earlier this year in Quebec, I managed to smack my head on the landing post. While I’m a big fan of adventure travel, co-ordination has never been my strong point. The two women are launched into the air and soar off into the distance, shrieks and screams trailing behind them like jet stream. They vanish from sight. The Velocity Zipline is so long I can’t see the end of it. I can only assume we land somewhere safely, and that ‘safely’ doesn’t mean tumbling somewhere into the Menai Straights. Planning a trip to Wales? Check out more things to do in North Wales. I step up to the platform beside the Spanish woman I’m paired with. Two staff members hook me up, double checking my harness and clipping me in. It’s a strange feeling, lying prone in the breeze, getting ready for the earth to fall away. 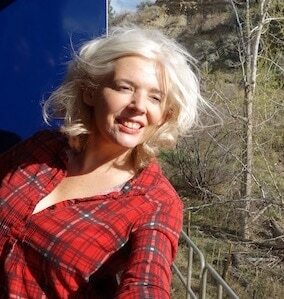 I feel both energized and frightened about the unknown journey ahead. I’d dwell on how this is a metaphor for life, but I don’t have time. The moment has come. I shoot out into space. “Eiyyyeeeeeeeee!” the woman screams beside me. I wait for the screams to burst out of my mouth, but … nothing. It may be the most beautiful feeling of nothingness in the world. It’s not a Superwoman feeling, or like falling off a cliff. The Velocity Zipline is definitely an eagle soaring experience. Logically, I know I’m hurtling headlong into the wind, but it feels as if I’m sailing with it and on it. I’m flying 1800 feet over the quarry pit. The rocks and stone look grey and bleak below. Now I’m speeding over a startling-blue quarry lake. It’s the most unexpected feeling of peace imaginable. Too soon I approach the platform. Noooo, I want to shout. I want to be a bird. It’s not until I’m slowing down (somehow magnetically, I can’t pretend to understand how) and jolt into the platform I realize how fast I was going in the first place. Did I reach speeds of 100 mph? I’d say no, but it was still a flash of a trip. In fact I wish it could have been slower to prolong the experience. Then again, it would hardly be the fastest zipline in the world if it just puttered along. Finding my sea legs – or my air legs – takes a second, then we head back to the Zip World Adventure Terminal to shed our gear. I spot the woman with the grey hair and we smile at each other in understanding. If the Velocity Zipline is a metaphor for life’s journey – no matter where you are on that path – it’s bound to be one heck of a ride. Photography: Some of the photos on this page are of the Little Zipper line that we did first. I grabbed what shots I could. This brings me to an important question: Can you bring a camera on the Velocity Zipline? Not a large one. I brought my iPhone but it had to stay tucked away during the ride. You could strap a GoPro to your helmet. Where is Zip World Penrhyn Quarry located? Zip World is located near the town of Bethesda in North Wales in the scenic mountainous region of Snowdonia. The night before we did the Zip World Velocity ride we stayed in Caernarfon at the Black Boy Inn. Dating back to the 16th century, it’s one of the oldest inns in North Wales. Caernarfon itself is a historic town known for its mighty castle and well worth visiting. It’s about a 30-minute drive from Caernarfon to Zip World. The next night we stayed in the seaside resort town of Llandudno, about 40 minutes away. Known as the Queen of the Welsh Resorts, Llandudno is one of the most touristy towns in the region with a pretty pier, Victorian architecture and gracious hotels. We stayed at the seaside St Georges Hotel, a 4-star property in the centre of town, and dined on market-fresh seafood at the Seahorse Restaurant at 7 Church Walks. Can you get to Zip World by public transport? Partly. You can take a train or bus to Bangor. From there it’s a 15-minute taxi ride to Penrhyn Quarry in Bethesda. This can get expensive, so it might be cheaper to rent a car. Culture tip: A zipline is often referred to as a zip wire in the UK. 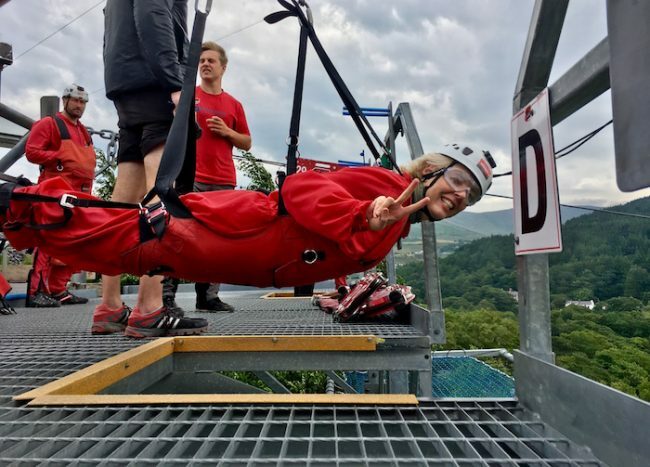 What should you wear for the Zip World Velocity Zipline? Depending on the time of year, it can be cold and rain can move in unexpectedly. On colder days wear gloves and warm and/or waterproof clothing. Closed-toe shoes like running shoes are recommended. Sandals and flip flops are not allowed. Safety suits, safety goggles and helmets are provided. Knee length shorts are allowed. First you sign in and gear up at the Zip World Adventure Terminal. You’ll have a safety briefing and are trucked up to Little Zipper, where you get a test run. Note: At 500 metres, the Little Zipper is not as ‘little’ as it seems. Then you move on to the Zip World Velocity Zipline and soar like an eagle. Travel tip: You need to arrive at Zip World at least 30 minutes before your activity time. If not you could lose your time slot without a refund. Do you need to book in advance? It’s highly recommended. Book on the Zip World website. Or you can book over the phone Tel: 01248 601 444 for a £3.50 surcharge. The bistro style Blondin Restaurant is located at the Adventure Terminal. Here you’ll also find a viewing platform, toilets, picnic area, shop and parking. Velocity Zipline price: Prices start at £70. 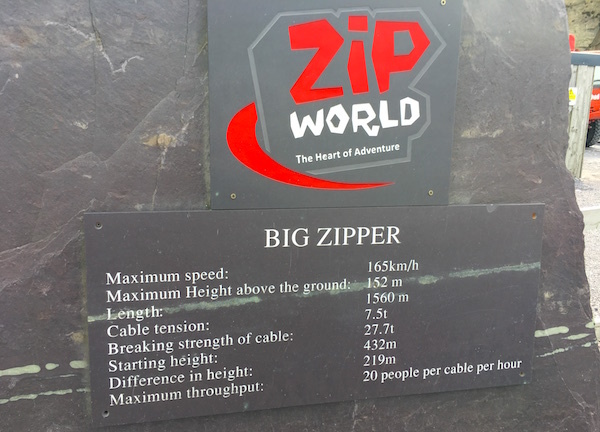 About the Zip World Adventure Experience: Don’t get confused because there are 3 Zip World locations and a wide range of outdoor adventure activities offered. 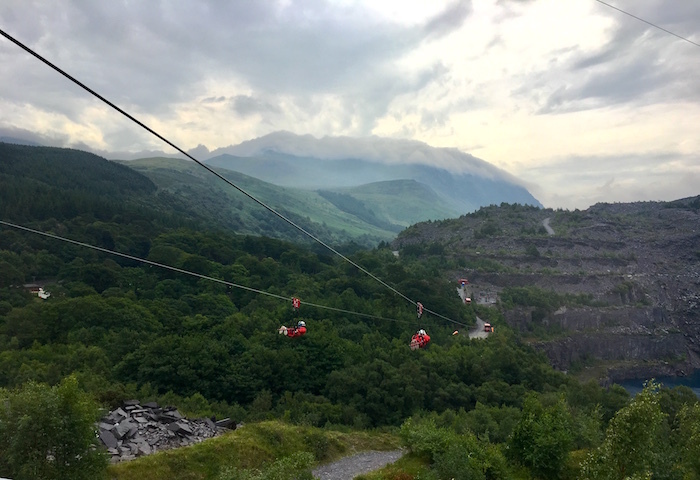 Velocity Zipline is at Zip World Penrhyn Quarry. Zip World Fforest in the Conwy Valley offers a Zip Safari, Treetop Nets and a Fforest Coaster. 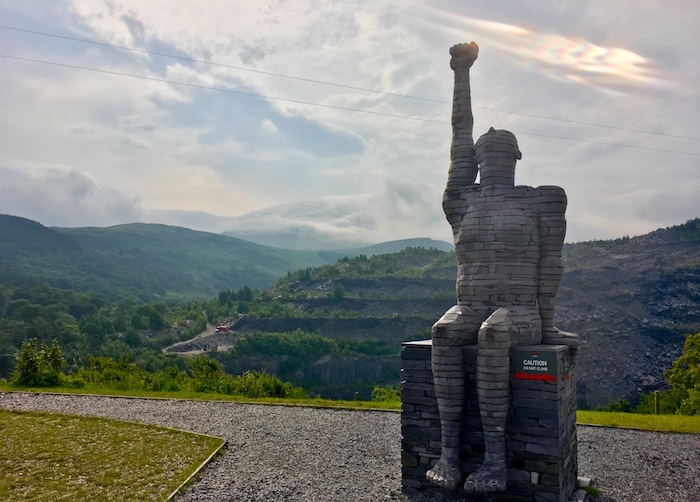 At the Zip World Slate Caverns you’ll find Titan, the first 4 person zip line in Europe and some subterranean adventures including Bounce Below and Zip World Caverns. Bounce Below is more family fun than challenging, but I laughed the whole time. Probably not for extreme adventurers. My trip was organized by Visit Wales and Visit Britain. All eagle-soaring opinions are my own. Read more about top European destinations.